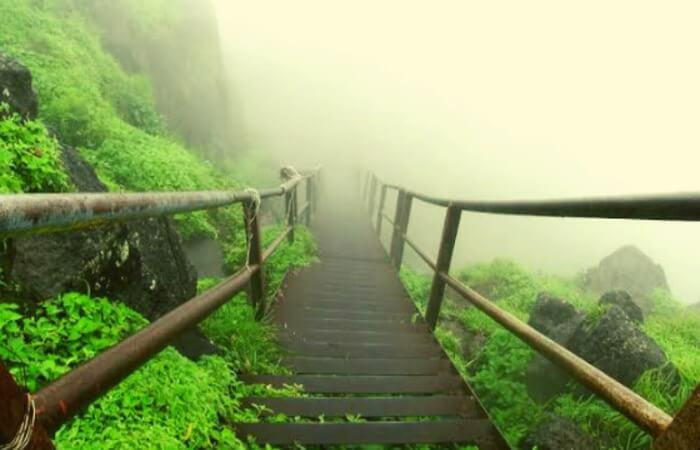 Weekend adieu in Maharashtra – explore the unexplored Beaches of Konkan and hike on the peak of mountain treks. Would you prefer standing on a cliff and feeling the chilly breeze blowing your hair and refreshing your heart, or dipping your feet in sterile blue water in the warmth of resplendent sand, taking a warm sunbath? Whether you are a Thalassophile or a mountain lover you would prefer calmness and exclusion of crowd while spending your vacation. When we talk about beaches we start picturing Goa in our minds, and mountains are related automatically to the Himalayas. Since these places have become very much explored and thus crowded it’s time you should delve into the unexplored beaches and mountains of India. Goa is the most favored getaway but Maharashtra has 840km vast coastline stretching along the Arabian Sea which cannot be underestimated. Some virgin beaches and solitary mountains are beautiful beyond imagination but haven’t been that famous to attract the mob but they definitely deserve some attention as well. Whether you are a beach person or mountain lover, If you are planning your next getaway you should take a glimpse at the list below to make a new memory at a refreshing place. Tired of your dull and tedious life? Looking for an escape? What can be better than enjoying your weekend at the beach amidst the waves? 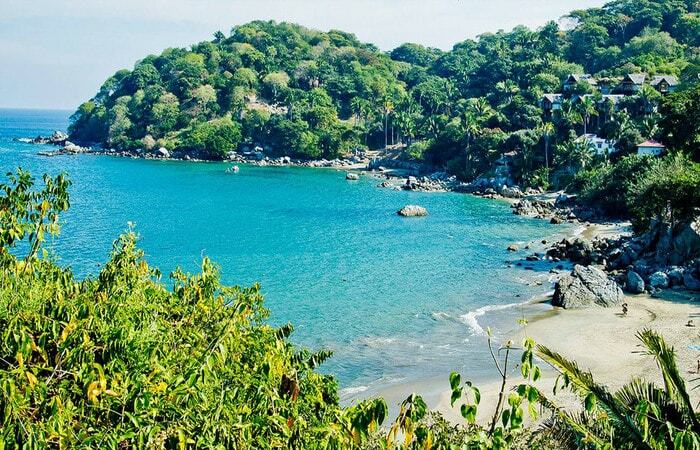 This divinely beautiful beach should be the first thing if you are planning a weekend getaway. Among the stunning beaches within the Konkan coastline, Tarkarli is the gracious and alluringly charming beach located in the Tarkarli village, Malvan, Sindhudurg district, Maharashtra. Malvan is around 385 – 390km from Pune city. Tarkarli beach has the most captivating and pristine white sands. Located on the conflux point of the exalted Arabian Sea and the babbling Karli River, this beach has a mesmerizing and breathtaking view. Apart from lying on the beach and gazing at the clear sky, the adventurous spirits can have an adrenaline rush by trying scuba diving in the crystal clear water with coral reefs living experience of a lifetime. The suitable time to plan your vacation would be in during the monsoons and in the winter season. If you are planning to do scuba diving then October to January is the best time as water remains clear during this part of the year. Dive into the crystal clear tropical waters of Tarkarli and delve into the vibrant underwater world. 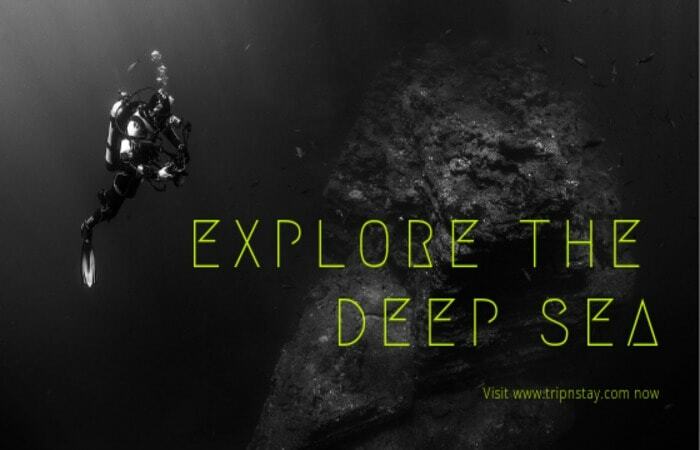 Your tour underwater will be accompanied by placid turtles, a vivid range of flamboyant fishes and the occasional wary of the shark as you explore the coral reefs. India’s first integrated and biggest scuba diving center, The Indian Institute of Scuba Diving and Aquatic Sports (IISDA), is also located in Tarkarli. Relaxing in the peaceful atmosphere, enjoying the serene beauty and falling asleep in the lilting lullaby of gentle waves is a treat to rejuvenate your mind and souls. 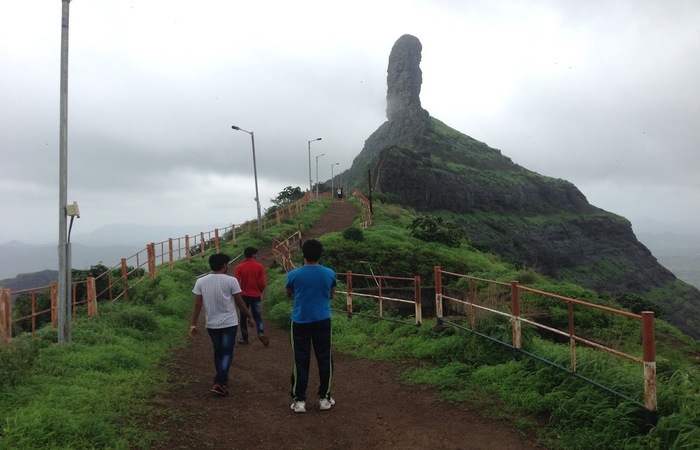 You deserve yourself this excursion if you visit Tarkarli. You are fortunate enough to witness the friendliest mammals if you visit this place between October to February. Schools of Dolphins arrive during a particular season and watching them frolicking in the waters is a memory you will cherish forever. 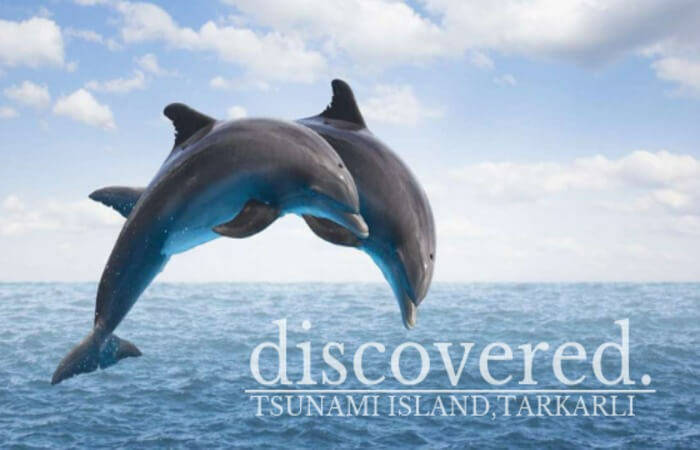 A tiny island in the delta of Karli River, Tsunami Island is the hub of Dolphin caravan and water adventures in Tarkarli. The entire village is welcoming and with an open heart, they ensure to make your stay comfortable. There are many resorts in the vicinity which make sure you stay in the lap of nature by providing a natural environment near the beach. By Air: Nearest airport to Tarkarli is Dabolim Airport of Goa. From there a private taxi can be hired that will take you to Tarkarli by a 2-hour car drive. By Train: The nearest railway station to the city is Kudla which is nearly 45km away from the destination. You can board trains from cities like Mumbai, Pune, and Goa to reach the city. 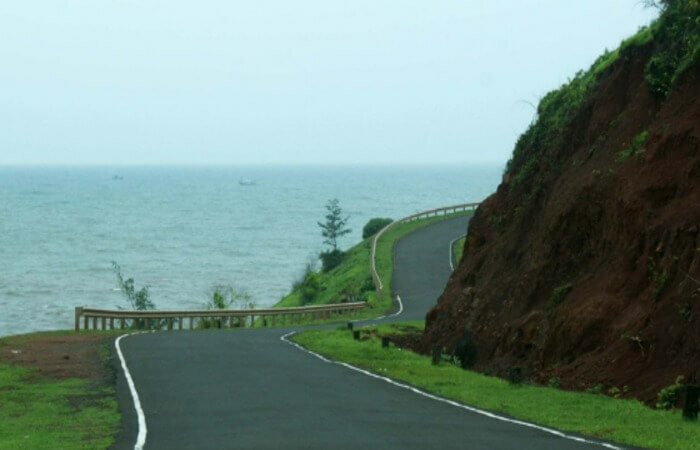 Guhagar is a demographic city in Ratnagiri district in the state of Maharashtra. Cloistered between the Vashishti River and the Jaigad creek, Guhagar is a small town on the Konkani coast with a beautiful isolated beach. The first beach along the Konkan coast, Guhagar means Cave house; this hidden gem in Ratnagiri is famously known for its beaches with Suru trees surrounding the beach, white sand, glistening turquoise waters making the scenic town a tropical paradise. The town has held a place in the political history of Maharashtra connecting it with the Peshwas, who were the Prime Ministers of the Maratha Empire so the ancient fort reminiscent of the time of yore adds beauty to this place. 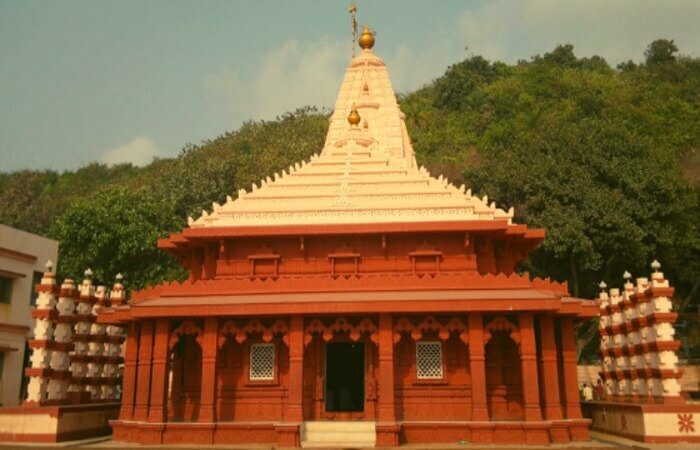 The place is also distinguished for its heritage temples – Durga Devi temple and Vyadeshwar temple attract the people of even the elder generation to pay a visit at this place. Mouthwatering seafood, coir items, coconuts, betel nuts and chiefly Alphonso mangoes are also the reasons people travel to see this natural beauty. This place is a blend of relaxation, adventure, history, religion, and enticing cuisine. Apart from enjoying the serene view in Guhagar, you can also devote your time to Vyadeshwar temple. A must visit an ancient temple dedicated to Lord Shiva is one of the main centers of attraction for the pilgrims and tourists. Ferry rides: Since Guhagar is sequestered between Dapoli to its north and Ganpatipule to its south across Dabhol creek and Tavsal creek. Ferries are available at both ends which take you to enjoy beyond Guhagar beach. 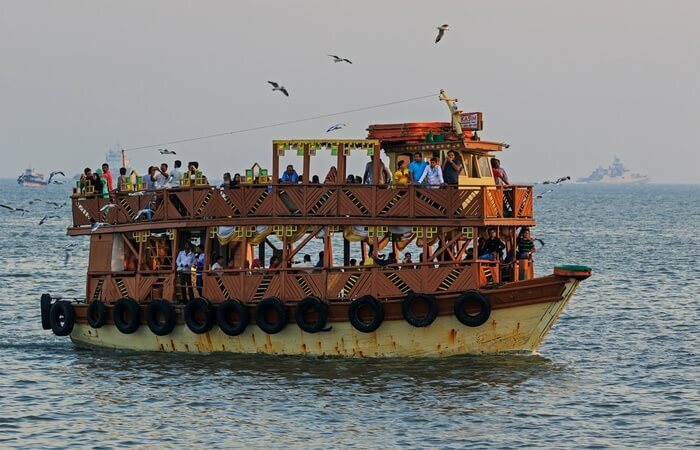 The nearby beaches can also be traversed by taking a thrilling ferry ride. Located about a kilometer from the Guhagar bus depot, this is another temple. Known to be one of the oldest temple dedicated to goddess Durga. Surrounded by lush green trees enhance the beauty of this temple. If you are looking for a vacation destination for young and adults this place is a perfect combination. You can enjoy the beauty by being near God seeking blessings. By Air: Chatrapati Shivaji International Airport is the nearest providing great connectivity with most major cities. From Mumbai to Guhagar can be traveled by bus. By Train: Chiplun railway station at a distance of around 40km is the nearest station to Guhagar beach. Where to stay: you can get resorts to stay near Guhagar beach which claims to give you a pollution free calm stay amidst nature. A spectacular weekend getaway in this paradise will surely make your vacation indelible. A perfect place for beach and adventure lovers. The exceptional beach is surrounded by a very well known Ganpati temple which makes the aura near the beach positive and pleasant. Your heart gets filled with tranquility and the existence of nature and god soothes all your discomforts and worries. If you are frustrated with your monotonous routine then you should definitely visit this splendid beach and get rid of all your worries with this thrilling getaway. Adventure water sports: If you are an adventure lover then this place offers you with thrilling water sports such as paragliding, swimming, water scooter. Get the feels of Goa excluding the crowd and commercialization at Ganpati pule beach. 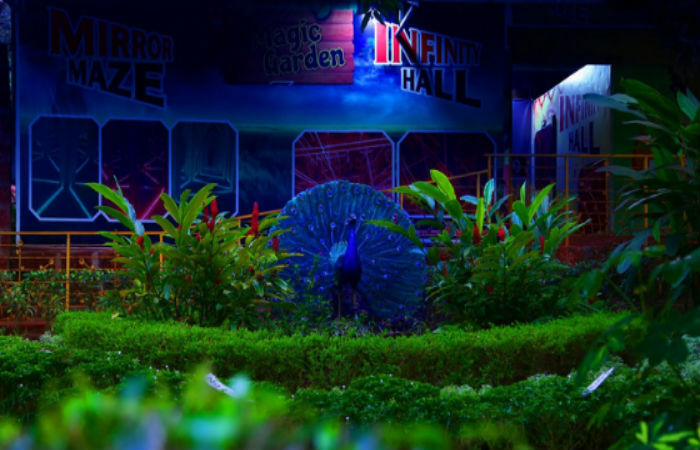 The newly constructed magical garden has become a great place of attraction as it offers five forms of magical bliss. 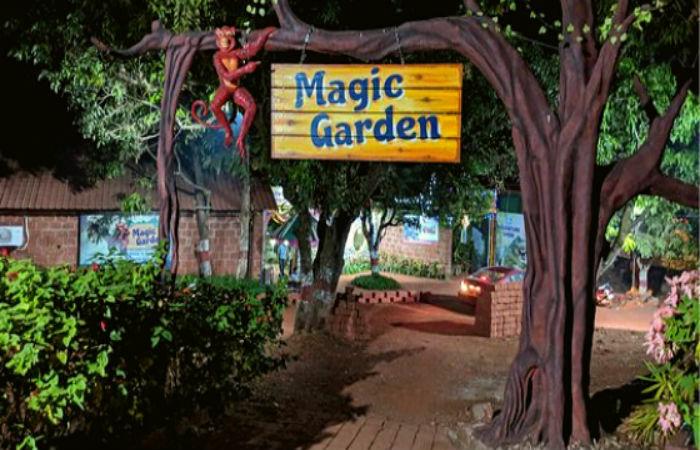 Art magic, 3-D magic, Live magic, horror magic, and food magic. Are you also keen to pay a visit to this incredible place? Plan your trip soon to get a delightful experience with your friends and family. A 400-year-old Ganesha temple, Swayambhu is built on pule which is nothing but white sand and is believed to be a self-created monolith of Lord Ganesha. Best time to visit: November to February is the most suitable time to visit this place. By Air: The nearest airport is Kolhapur, which is at a distance of around 144 km. other nearest airports are Mumbai and Ratnagiri. By Train: The nearest railhead is Bhoke, 35 km from the destination and Ratnagiri which is 45km. By Road: you can also plan a road trip to this place. Going to a Himalayan trip can indulge many days of your work, but if you want to get a short trip to the hills, trek on the rocky mountains and craggy terrain by viewing the ancient forts on your way up, you should undoubtedly take a look at these mountain peaks which have a lot to offer you. The highest peak in Maharashtra with a height of 1646 meters or 5400 feet is known as the” Mount Everest of Maharashtra”. 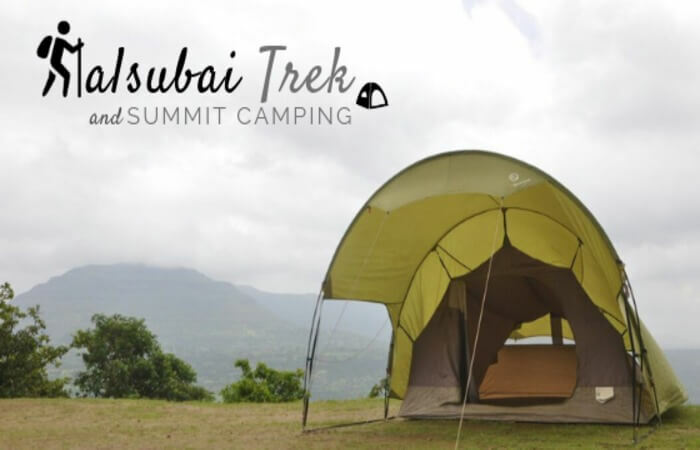 Kalsubai Mountain lies in the Sahyadri mountain range falling under Kalsubai Harishchandragad wildlife sanctuary. The view is enthralling from the top. To facilitate the trekker’s steel railings, chains and ladders are placed where the trek takes a difficult turn. Once you reach the top the view is very satisfying as you Bhandardara dam in the vicinity. The top view also holds the Kalsubai temple which makes the view even more worthwhile. The night trek is no less enchanting. A view of the sky filled with dazzling stars makes the experience of the trek unfading. Igatpuri, which is 40 km, is the nearest town to Bari. You can reach to Bari from Igatpuri by road. 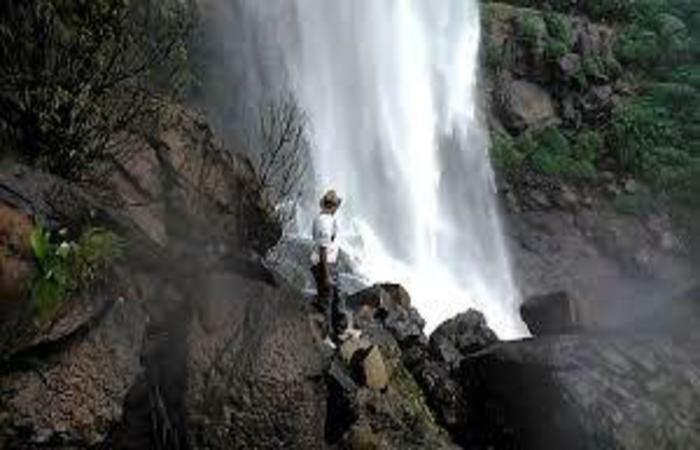 Suitable time to visit: Excluding summer season as the sun is very harsh during that time; monsoon and winter season can be a favorable time to enjoy this trek. Food and stay options: The dhabas at the base village, Bari serves local Maharashtrian appetizing food. If you decide to set up a tent at the top, then taking some food along would be a good option. 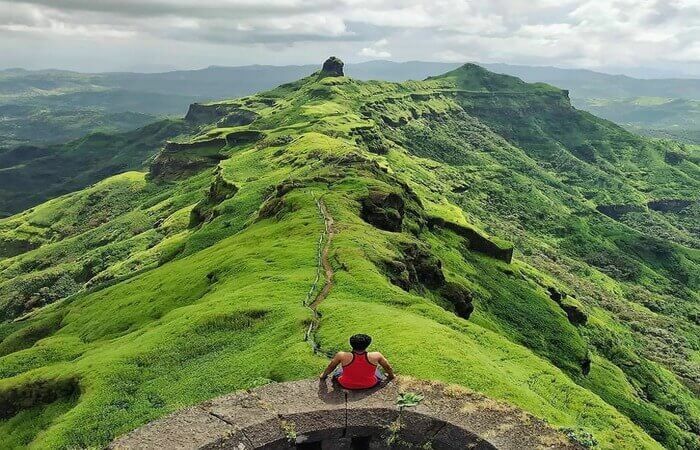 Torna Fort or Prachandagad means massive fort is located in Pune, Maharashtra. It is the first fort captured by Shivaji Maharaj in 1643, at the age of 16. His enhances the historical importance of this place and adds in your bucket list. 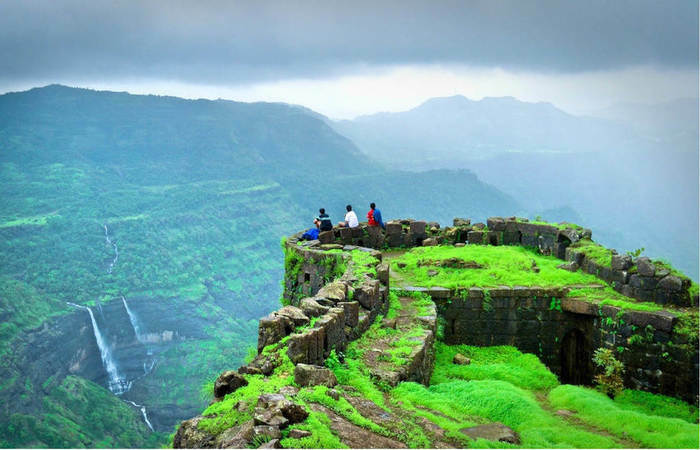 The mountain has an elevation of 1403 meters (4603 feet), making it the highest fort in Pune. India has a total of 525 forts out of which 266 forts are in Maharashtra itself. There is so much to explore in this state. You can also drench your soul while returning from Torna Fort at Madhe Ghat Waterfall which will add more exuberance to your trip. Take a tour in the village which you won’t regret as you constantly pass by beautiful waterfalls, lush green valleys, and numerous lakes. The fort is 60 km from Pune and 210 km from Mumbai. By Air: The nearest airport is Pune. Various road transport options are available to reach Torna fort from the airport. 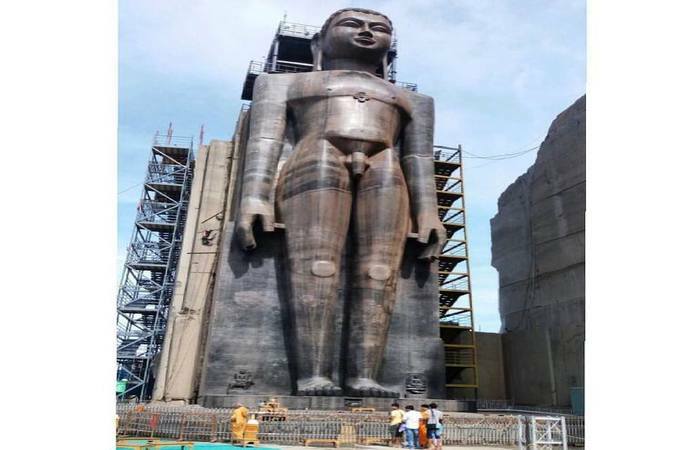 By Train: Pune and Mumbai are well connected with the other parts of the country by railways which make reaches Torna a convenient option. From Torna Fort, Madhe Ghat is 15 km. But since there is no public transport available so it’s better to rent a bike Pune which would cost you around 300/day INR. Suitable time to visit: Trekkers usually prefer monsoon and post-monsoon season to visit this place as the place get all floras and the view becomes magnificent. After reaching on the top you can see Menghai Goddess temple, Budhala Machi, and Bini Darwaja. Food and stay options: The Menghai temple is an option where you can stay at night but it can only accommodate 20-30 people. You cannot set up your tent due to the fast blowing winds. At the base of the climb you have shops to eat, but don’t forget to carry some on the top with you. The temple has some locals who also serve food to earn their livelihood. Fort trek difficulty level: Medium to high. The trek becomes a bit difficult in the rains due to losing rocks and slippery terrain. About 150 km from Nashik, situated in Baglan tehsil, Mangi Tungi is described as Siddha Kshetra which means the gateway to the state of enlightenment. The Mythological tales tell us that even Lord Rama and Lord Krishna had attained Moksha, the enlightenment at Mangi Tungi. Apart from religious and spiritual importance, Mangi Tungi holds great heritage value. Mangi Tungi is a twin pinnacled peak with a plateau in between, located near Tehrabad. Mangi peak is 1324m (4343 feet) whereas Tungi peak is 1331m ( 4366 feet) above the sea level. Hundreds of idols and deities carved out of the mountain rock are the main culmination of that place. By Train: the nearest railway station is Manmad and from there, taxi or bus option is available to reach Mangi Tungi. By Road: It is 451 km from Mumbai to Mangi via Shirdi, Nashik. Suitable time to visit: Monsoon is the best season to enjoy this trek when the land is covered with greenery all around. Fort of Kanchanpur, Fort of Mulher, Caves of Dongaria Deo are some of the must visit places near your trek. The trek is relatively easy. Food and stay options: There is a Dharamshala in the village which can accommodate 10-15 people. The dining facility is available at Bhilwadi, but no water is available on the fort so it should be taken from the village itself. Locals can help you arrange the food.